It happens all the time: One moment you’re scrolling through Facebook or Twitter, you see an article headline that catches your eye, and you tap on the link to read more. Then, you wait. Still waiting three seconds later? Time to move on. Google reports that more than 40 percent of users will abandon a website that takes more than three seconds to load. Mobile internet users expect a web browsing experience that’s akin to what we get on our computers. But even with faster Wi-Fi connections and cellular data networks, reading on the mobile web can still be a painfully slow and frustrating experience. The Accelerated Mobile Pages (AMP) Project is an open source initiative that’s putting an end to this frustration. The project’s mission is simple: empower publishers with the tools they need to create optimized content that loads instantly, everywhere. Launched by Google in October 2015, the AMP project is built on AMP HTML, which allows websites to build lightweight webpages that load instantly. If this all sounds a bit familiar, it should be: Both Facebook and Apple have launched similar “instant” publisher services. Facebook launched Instant Articles in May 2015, followed by Apple’s Apple News launch in June 2015. But AMP is different. Since the platform is open source, Google is empowering publishers with a speedy means for instant content distribution on the open web, rather than sandboxing publishers inside an app. AMP pages load four times faster and use eight times less data than traditional mobile-optimized pages, reports Pinterest’s product engineer Jon Parise. Nuzzle founder Jonathan Abrams told Fortune that an AMP page will load in less than half a second, while the average mobile page still takes three seconds to load. Those extra seconds make a big different for page engagement, and that’s good news for publishers and advertisers. As Google points out in their AMP announcement, ads help to fund free services and content on the web. Slow load speeds cut down on readers. This hurts engagement and page views, and ultimately disincentives advertisers to sponsor a page, thus undermining the publisher and reducing their ability to offer free content. With AMP, sites are free to retain their choice of ad networks and formats that don’t detract from the user experience, including subscriptions and paywalls. 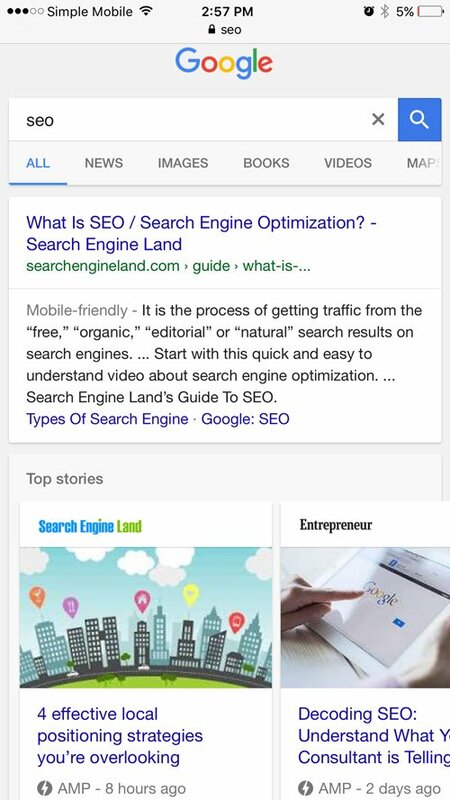 Currently, the Google News carousel sits above the fold on mobile devices, which pushes down organic search results, even if the organic results are more current. Consider this search result for “primary result” conducted on May 18, the day after the Democratic primaries of Kentucky and Oregon. 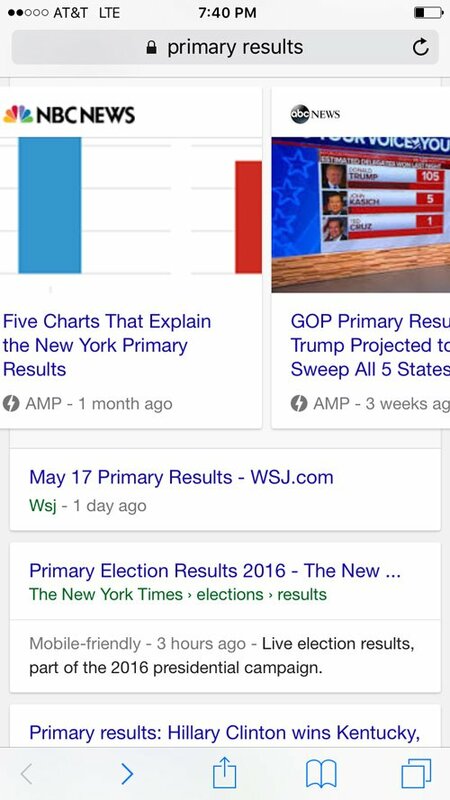 A quick flip through carousel results reveals AMP articles from primaries that took place over one month ago ranking above the organic search results for the May 17 primary. If you want your content to be found first, it needs to live in the News carousel, and the only way it can get there is if you’re using AMP on your site. Time on site matters. Even if the main page for your mobile site loads reasonably fast, if your articles also don’t load quickly, then visitors will still get frustrated and click away. With AMP, your article content loads in a split second, significantly reducing wait time frustration and keeping visitors engaged with your site. This, in turn, lowers bounce rate and improves on-site time, which Search Metrics reports correlates with a higher ranking. This third benefit isn’t 100 percent official, but it still bears mentioning. As Google increases the importance of mobile load speed and user experience for site rank, the presence (or lack) of AMP pages on a mobile site could very well become a factor in search rank. Last year, we saw Google make a major push towards mobile-friendly sites. “Mobilegeddon” marked Google’s shift towards penalizing businesses that didn’t have mobile-friendly sites by eliminating those sites in search results—and it’s only going to get worse for sites that are not optimized for mobile screens. What Publishers, Brands, and Tech Companies Use AMP? 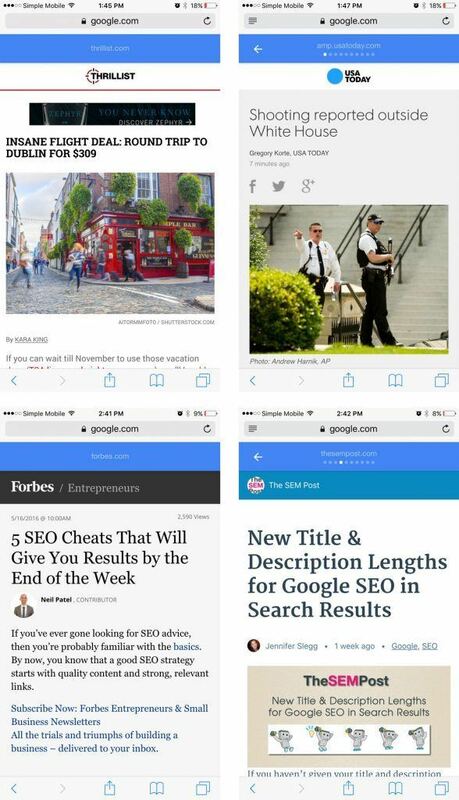 From USA Today and BBC News to Twitter, Thrillist, Forbes, and The SEM Post, several publishers and technology companies are supercharging their sites with AMP. AmpProject.org shows a list of all known companies currently using AMP. Adding the AMP WordPress plugin to your website is a must-do. Not only will your site load substantially faster, but you’ll also gain access to Google’s massive content delivery network. When people search for your website on their mobile devices, Google will serve up the AMP version of these pages, all for free. 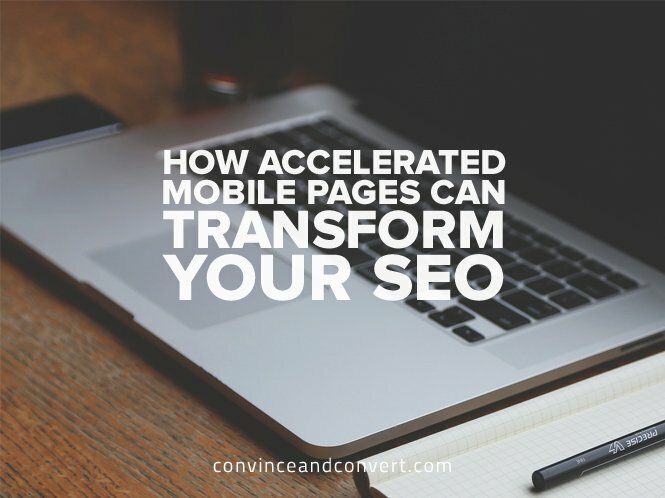 Paste the URL of your Accelerated Mobile Page in the omnibox. 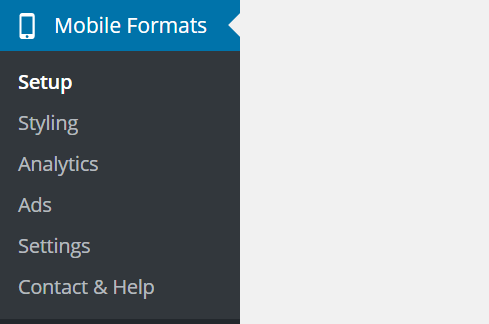 Go back to the main menu and click “Styling”. 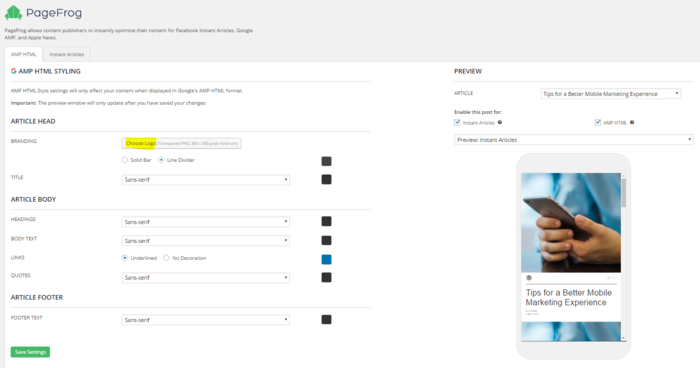 Go back to the main menu, click “Analytics” and add your Google Analytics account information here. Once you have setup your AMP content on WordPress, you can verify whether Google has indexed it properly through the Google Webmaster tool. It usually takes four to five days for Google to index this content. In addition to adding the plugins above to your WordPress site, you may also wish to boost page discoverability and integrate with third party platforms via metadata, like Schema.org. The AMP Project offers a starter guide to both of these tasks on its website. Finally, while AMP may not be a “magic bullet” for getting your content found in mobile search results, it is a critical step towards stronger engagement, better visibility, a lower bounce rate, and ultimately, a higher mobile ranking. Andy Beohar is Vice President of SevenAtoms, a HubSpot- and Google-certified digital marketing agency in San Francisco. Andy develops and manages ROI positive inbound and paid marketing campaigns for B2B, technology, and E-commerce companies.